This trip around the world is not only about “seeing the world” nor about “visiting 48 countries in 365 days”. For us it is more like an opportunity to do new things, to get to know other cultures better and foremost, to get to know ourselves better, by doing new, interesting, challenging things. 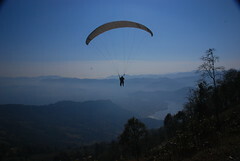 Therefore we decided to go and have a look at the Himalayas from a completely different angle and go paragliding! Around 10 in the morning, we were thrown out of a minivan and had to walk 2 minutes to the take-off-point for our “flight”. In the beginning the wind wasn’t strong enough to take off for two people at the same time (as we had never done this before, we took a so-called “tandem-flight” which means you fly with an instructor who knows what he is doing) so we had to wait a bit, a time in which Vera’s Russian instructor “Victor” explained us some basic notions. Jean-Christophe was going down with a Nepali instructor. The take-off was definitely one of the best things of the adventure: all of a sudden, when the wind was judged strong enough by our instructors, a strong pull on the strings got the parachute picked-up like a big colored bird. Then, on a hastened “Go!”, we started running very fast towards the edge of the cliff, until the parachute picked up enough wind and we realized we were running in the air. And hop! Childhood memories came up, when we plunged forwards into the air, like on a giant swing! From up we had beautiful views on the Himalaya on one side and the Phewa Lake in Pokhara on the other before we slowly, slowly started our descent towards the landing. Carefully, not to land in the lake, we navigated towards the landing site. And although our flight had been very gracious so far, this is where the problems started (one has to admit it: it had been too good to be true so far…): Vera fell over with her nose in the grass, whereas Jean-Christophe managed to land AND vomit at the same time! This entry was written by Vera and posted on December 14, 2007 at 15:26 and filed under Nepal, World Trip. Bookmark the permalink. Follow any comments here with the RSS feed for this post. Both comments and trackbacks are currently closed. bel atterrisage dites-donc! comment va ton nez Vera? Et Jean-Christophe, c’était le vertige comme ton cousin? J’espère que tu as aussi apprécié quand-même? Cela dit, comme expérience de dépassement de soi, c’est pas mal! Et ça doit être grandiose! En plus dans des paysages pareils! Bon atterissage dans vos nouvelles contrées! Au fait… Comment avez-vous pour partir de l’himalaya en parapente et atterrir en Thaïlande ? @ Florent : J’ai pas vomis en Thailand, mais sur les bords du lac de Pokhara !! Pour la Thailand, on a pris la luxueuse companie Thai Airways de Katmandu a Bangkok. Voyage avec le tout nouveau Boeing 777, tout confort et spacieux, meme en classe eco. jean-christophe, avais-tu un sac en papier comme au Mexique??? ?superbe expérience! oubliez vite l’aterrissage et remontez bien vite à la hauteur des aigles. Ce doit être génial même enayant la trouill! bises à tous deux. Merci pour ces superbes photos qui me font voyager depuis mon bureau. Je vous souhaite une très heureuse année 2008 riche en découvertes et rencontres. Je vous embrasse bien fort. 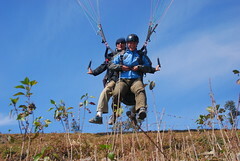 I am pleased that flight left not overlooked impressions in your travel on paraplane.